Our next team challenge is the Pullup/Chin Up Challenge. The challenge will run from TODAY through August 31st (approximately 16 weeks). GOAL – everyone in WOL do 1 pull-up alone with no assistance. Encourage your teammates to do this together. AWARDS: We have about $1000 of different gift cards and cash to giveaway for this contest. All folks who reach a tier level. Everyone has to do it in front of a Without Limits Coach in order to get credit. Meet a coach before or after practice or when convenient. If you absolutely cannot do it in front of a coach, then you must submit video. 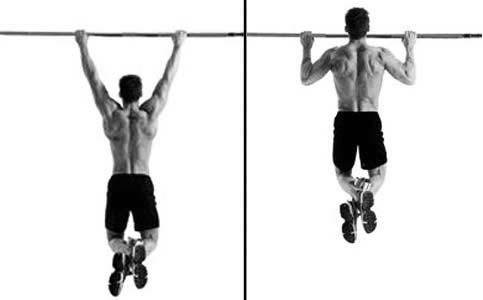 Proper Pullup form starts by fully hanging on a pullup bar. Grip the bar shoulder-width apart with straight arms (palms can face you (chin up) or turned away (pullup). Pull yourself up by pulling your elbows to the floor. Keep pulling until your chin passes the bar. Lower yourself all the way down until your arms are straight. KEEP TRACK OF WHERE YOU STAND HERE. NAMES WILL BE ADDED AS PEOPLE BEGIN THEIR TRIALS. ** For athletes that have arm or shoulder issues and cannot medically perform a pull-up – you have the option to do a FLEX ARM HANG, here is the flex arm hang protocol. The starting position is with the chin above the bar, and both feet off the ground. You can reach the starting position by standing on a support, or if necessary assisted by others. The grip can be either with both palms facing forward or to the rear, though with both facing in the same direction. The aim of the test is to hold this position for as long as possible. The timer is started when the Participant is in position with chin above the bar and does not stop until chin touches or falls below the bar. The feet may not touch the floor during the test.